Sea scallops are one of the easiest and most flavorful seafood to grill. Care must be taken not to overcook them, lest they become rubbery. The George Foreman Basic Grill is a perfect solution to not overcooking scallops. When testing out this recipe, I tried bay scallops as well. I literally turned them into little hard disks by leaving them on the grill for too long. I think the larger, ocean sourced, sea scallops are really the better way to go when grilling. Bay scallops lend themselves well to seafood chowders, bouillabaisse, and cioppino (an American seafood stew from San Francisco). The recipe I am sharing here is sea scallops served over a bed of golden saffron rice. Saffron is the delicate stamen of the crocus flower. It is wildly expensive and not always easy to come by. The good news is that you only need 2 or 3 threads of it to successfully infuse the rice with flavor and rish color. This may be $1.00 of your tiny stash of saffron. I was able to buy a small amount of saffron from Trader Joe’s for less than $7.00. When shopping for sea scallops, try to find ones that are dry rather than soaking in a milky bath. Ask for “diver scallops”. This is a term used to indicate that the scallops are freshly hand-harvested from the ocean floor. Many come from the clean cold waters of coastal Maine. Try to avoid frozen or previously frozen scallops, if possible. Scallops, just like lobster, love to be seared in butter. I have found that a mixture of butter and extra virgin olive oil (EVOO) works a bit better. The oil keeps the butter from burning and turning bitter and dark in color. For the rice, I love the flavor of white basmati for this dish. My second choice would be jasmine. Otherwise, long grain white rice is fine. While I am a huge fan of brown rice, it just doesn’t work for this recipe. Because rice often gets a bad rap for being laced with ground water toxins, I suggest you look for organic, non-GMO varieties. The last important ingredient is peas. Fresh peas are not worth the effort here, in my opinion. You can find flash frozen, organic peas at the market that work just fine with as much flavor and less work. They also cost less. Get the large peas, not the baby ones if possible. If you don’t like peas, just leave them out and maybe top the rice with toasted slivered almonds. Now, let’s get on to the recipes. Start by making the rice first. The scallops will take a minute or two to grill. This recipe serves 2 people. You may also consider serving a nice side salad of fresh arugula and radishes as a side dish to accompany these recipes. 1. Thoroughly rinse the rice in a large sieve or small holed colander under cold running water until it runs clear. Shake the sieve to get rid of the excess water. 2. In a small pot with a lid, heat the oil and garlic over medium. Add the rice and stir to toast, approximately 3 to 4 minutes. 3. Add the chicken broth to cover the rice approximately 1/2 inch. Add the saffron threads. Bring the broth to a boil. Lower the heat to a simmer and cover the pot. Simmer for 13 minutes. Add the peas and simmer for 2 or 3 more minutes until all the broth is absorbed and the rice is soft and golden. 4. Remove from the heat and let the rice rest another 5 minutes with the lid on. 5. Add the lemon zest and fluff the rice lightly with a fork. Season with salt and pepper. (While the rice is resting, preheat your Foreman Grill). 1. Preheat the grill to high while your rice is resting. Pat the scallops dry while the grill is heating up. 2. Mix the butter and EVOO together well. Brush or coat the hot grill with the fat, top and bottom. Add the scallops immediately and close the lid on the grill. Grill the scallops until just opaque and milky white with a nice sear on the outside. This will take approximately 1-1/2 to 3 minutes. Check at 1-1/2 minutes. If not done rotate them 45 degrees just to add some cross grill marks. 3. 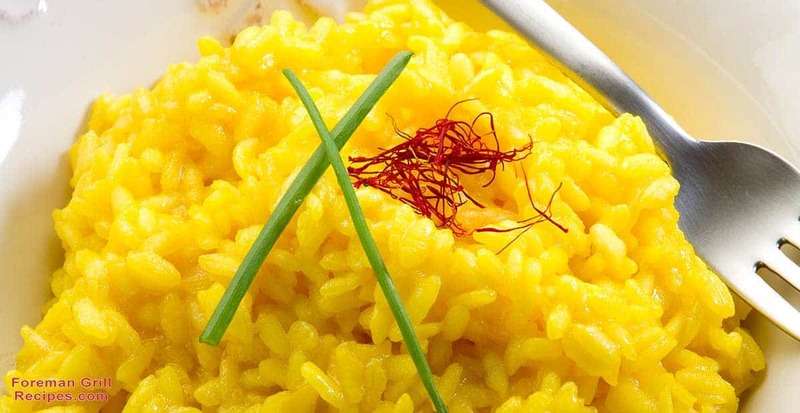 Serve the scallops on the saffron rice with a little salt and pepper and a squeeze of lemon juice. 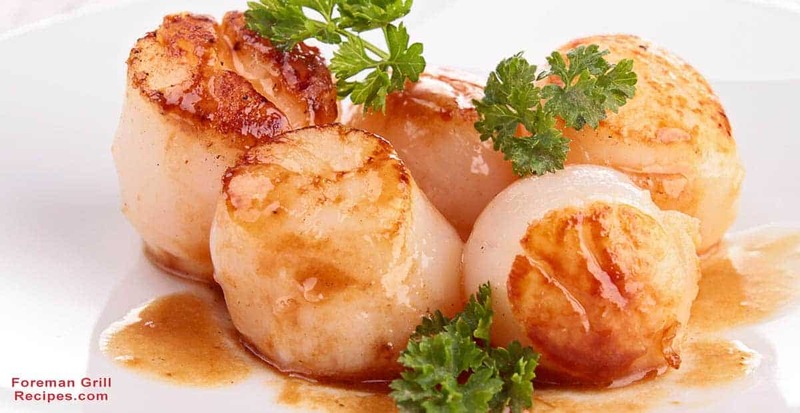 Sea scallops are not a significant source of fat. In fact, they contain no saturated or trans fat. They are a great source of protein and a natural source of sodium, an electrolyte. They do provide some iron. They are rich in selenium. Selenium is necessary for proper thyroid function. It also protects our cells from damaging free radicals. Scallops also provide us with good amounts of vitamin B-12.